We understand that a manufacturer of quality products hold command in market and this leads to strong global clientèle. 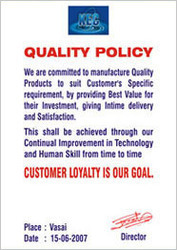 Knowing the value of quality products, we always emphasize to manufacture optimum quality products. We follow computerized design and drafting for customized production as per clients requirements. Our products are at par with various Indian and International quality standards such as BS, IS, ASME and TEMA. Apart from our own quality inspection team, we also have imparted the quality checking process to different third party inspection agencies. We arrange heat treatment, radiography and dished end forming from recognized subcontractor. We carry out the testing of the raw materials for chemical and mechanical properties form the Govt. approved laboratories. We impart the quality assessment to those third party inspection agency who facilitate 100 % Radiography. We also have association with Welder associated, a qualified welder for up to 6G Position.